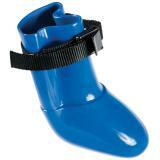 Rubber boot especially made for sheep and goats to protect a foot when being treated. 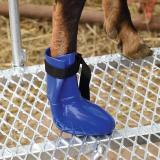 For treating sheep or goats that have footrot or scald. Also helps with animals that have a cracked or broken hoof. Prevents dilution and pollution of the hoof by water or dirt. Retains medication around a sheep or goat hoof. Can be cleaned and reused. Trim and clean problem foot. If using FootCure™ spread a thin coat of the paste over any sore spots. Use pressure to work it into any deep rot areas. 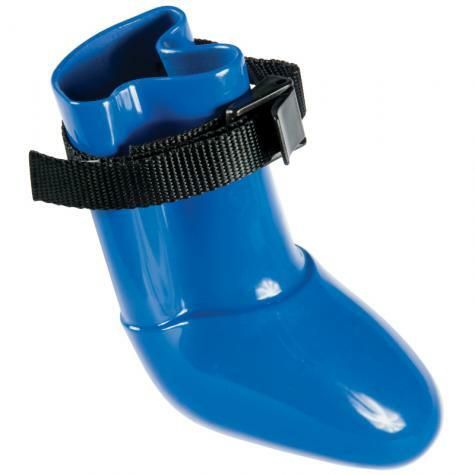 Place boot over the foot and pull the strap at the top tight. If you are using liquid zinc for the treatment, put the boot on first then add the liquid. Pull the strap tight and use SureFlexx™ Elastic Bandage Wrap to seal the top. The boot should be on no more than one to two days. Keep the animal in a clean dry area and repeat treatment if needed. Do not leave the boot on longer than two days at a time. The foot needs fresh air to heal. Cuts and cleans up the extra hoof growth on sheep and goats. Recommended: 5 out of 12 said they would recommend this product to a friend. Appeared to be well made, but clip broke loose within 12 hrs and is lost somewhere in the field. Not for a large ram. Way cheaper just buy a child's rubber and vet tape it. Good product for the individual sheep foot rot treatment when standard treatment difficulty or not responding. Needs some improvement work: the strap doesn't tighten down on skinny legs, gum from duct tape will prevent locking from the adhesive. Also making the color RED would make it much easier to find in a pasture when the sheep feels better and escapes. It worked perfectly on my adult Boer Doe. I did wrap the top with vet wrap, but probably did not need too. Are used the Medi boot on my Boer goat herd for a few foot issues and they work great no issues and stayed on well even with some rambunctious does! I highly recommend this product!!! This product works well if you can contain the sheep in a more confined space for a few days (dry lot or barn) and then take the boot off after a couple of days. The very best way to ensure it stays on, in our use, was to use the bandage wrap and start on the Mediboot and then wrap around the leg of the sheep. It was still able to pivot, which we didn't like, but it made sure it stayed on and the sheep with footrot could keep the foot dry and allow the FootCure to work. Wouldn't recommend for smaller sheep or lambs.